Loving yourself and others opens DOORS. 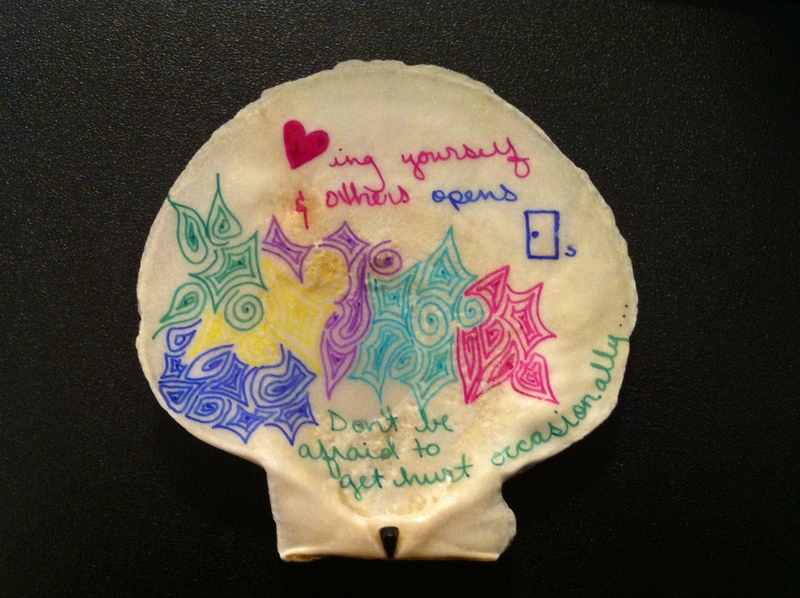 Home / Adviart Blog / Loving yourself and others opens DOORS. Loving yourself and others opens DOORS. Don’t be afraid to get hurt occasionally. This adviarter picked this shell because of its great surface area relative to other shells. The colors and mix of words and design make this adviart exciting, bright, and engaging. The adviarter took tremendous time in putting the design portion together on the shell after laying out the words in pink and the drawing in blue. She wanted to ensure the design was up to par after she got her main piece of advice on the shell. This adviarter also has a tremendous grasp of the English language and grammar–asking me to learn to use rubbing alcohol or acetone to remove a slight mistake she made when working on the design. Not only did I learn from the advice but I learned from the practical knowledge. Loving yourself and others opens DOORS is such a fitting piece of advice. It is only through loving self and knowing self that we can be our best and love others boldly. I am a fan of opening doors and have to say that I haven’t put much priority in opening up doors to others as much as I could have over the past few years. Perhaps that is from a fear of getting hurt or perhaps it is from not being as loving about self–realizing that a perfectionist mentality can hamper the ability to appreciate your own assets and love yourself unconditionally. The part on the bottom of the shell about not being afraid to get hurt occasionally initially made me think about fear of pain and maybe failure. However, when I look back at pain and failure, these are the two things that have taught me the most. My question then is how to ensure that we love ourselves to love others on a routine basis? Maybe not routine…maybe a consistent basis. The action item–to realize that we can heal from hurt and grow from it. Why should we fear getting hurt? It seems like yet another excuse to not execute on something–and very anti-tornado.